This article is about the propeller-driven aircraft. For other uses, see T34 (disambiguation). The Beechcraft T-34 Mentor is an American propeller-driven, single-engined, military trainer aircraft derived from the Beechcraft Model 35 Bonanza. The earlier versions of the T-34, dating from around the late 1940s to the 1950s, were piston-engined. These were eventually succeeded by the upgraded T-34C Turbo-Mentor, powered by a turboprop engine. The T-34 remains in service more than six decades after it was first designed. The T-34 was the brainchild of Walter Beech, who developed it as the Beechcraft Model 45 private venture at a time when there was no defense budget for a new trainer model. 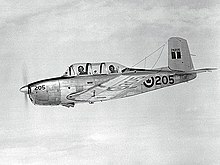 Beech hoped to sell it as an economical alternative to the North American T-6/SNJ Texan, then in use by all services of the U.S. military. Three initial design concepts were developed for the Model 45, including one with the Bonanza's signature V-tail, but the final design that emerged in 1948 incorporated conventional tail control surfaces for the benefit of the more conservative military (featuring a relatively large unswept vertical fin that would find its way onto the Travel Air twin-engine civil aircraft almost ten years later). The Bonanza's fuselage with four-passenger cabin was replaced with a narrower fuselage incorporating a two-seater tandem cockpit and bubble canopy, which provided greater visibility for the trainee pilot and flight instructor. Structurally, the Model 45 was much stronger than the Bonanza, being designed for +10g and −4.5g, while the Continental E-185 engine of 185 horsepower (hp) at takeoff (less than a third of the power of the T-6's engine) was the same as that fitted to contemporary Bonanzas. Following the prototype were three Model A45T aircraft, the first two with the same engine as the prototype and the third with a Continental E-225, which would prove to be close to the production version. Production did not begin until 1953, when Beechcraft began delivering T-34As to the United States Air Force (USAF) and similar Model B45 aircraft for export. Production of the T-34B for the United States Navy (USN) began in 1955, this version featuring a number of changes reflecting the different requirements of the two services. The T-34B had only differential braking for steering control on the ground instead of nosewheel steering, additional wing dihedral and, to cater for the different heights of pilots, adjustable rudder pedals instead of the moveable seats of the T-34A. T-34A production was completed in 1956, with T-34Bs being built until October 1957 and licensed B45 versions built in Canada (125 manufactured by Canadian Car and Foundry), Japan (173 built by Fuji Heavy Industries), and Argentina (75 by FMA) until 1958. Beechcraft delivered the last Model B45s in 1959. Total production of the Continental-engined versions in the US and abroad was 1,904 aircraft. The Model 73 Jet Mentor. In 1955 Beechcraft developed a jet-engined derivative, again as a private venture, and again in the hope of winning a contract from the US military. The Model 73 Jet Mentor shared many components with the piston-engined aircraft; major visual differences were the redesigned cockpit which was relocated further forward in the fuselage and the air intakes for the jet engine in the wing roots, supplying air to a single 920 lbf (4.1 kN) Continental J69 jet engine in the rear fuselage. The first flight of the Model 73, registered N134B, was on 18 December 1955. The Model 73 was evaluated by the USAF, which ordered the Cessna T-37, and the USN, which decided upon the Temco TT Pinto. After initial testing at the Naval Air Test Center at NAS Patuxent River, Maryland, the Navy tested the feasibility of using the TT Pinto as a jet-powered trainer for primary flight training in 1959, but discontinued use of the aircraft by December 1960 and discarded all examples, returning to the piston-powered T-34B Mentor and North American T-28 Trojan for its primary flight training requirements. The Beechcraft Model 73 was not put into production and the sole prototype is displayed at the Kansas Aviation Museum. After a production hiatus of almost 15 years, the T-34C Turbo-Mentor powered by a Pratt & Whitney Canada PT6A-25 turboprop engine was developed in 1973. Development proceeded at the behest of the USN, which supplied two T-34Bs for conversion. After re-engining with the PT6, the two aircraft were redesignated as YT-34Cs, the first of these flying with turboprop power for the first time on 21 September 1973. Mentor production restarted in 1975 for deliveries of T-34Cs to the USN and of the T-34C-1 armed version for export customers in 1977, this version featuring four underwing hardpoints. The last Turbo-Mentor rolled off the production line in 1990. Since the late 1970s, T-34Cs have been used by the Naval Air Training Command to train numerous Naval Aviators and Naval Flight Officers for the U.S. Navy, U.S. Marine Corps, U.S. Coast Guard, and numerous NATO and Allied nations. With over 35 years of service, the T-34C has been completely replaced by the T-6 Texan II. 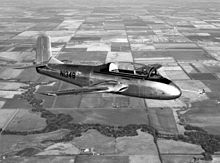 The first flight of the Model 45 was on 2 December 1948, by Beechcraft test pilot Vern Carstens. In 1950, the USAF ordered three Model A45T test aircraft, which were given the military designation YT-34. A long competition followed to determine a new trainer, and in 1953 the Air Force put the Model 45 into service as the T-34A Mentor, while the USN followed in May 1955 with the T-34B. After extensive testing, the USAF ordered the Mentor into production as the T-34A in early 1953. The first production T-34A was delivered to Edwards Air Force Base, California, in October 1953 for evaluation, and deliveries to the Air Training Command (ATC) began in 1954. 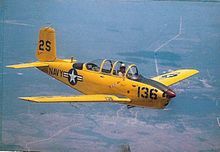 The T-34A commenced service as USAF's initial primary flight trainer at "contract" pilot training air bases across the southern United States, replacing extant North American AT-6 Texan trainers. Following training in the T-34A, USAF pilot trainees would advance to the North American T-28A Trojan for intermediate training. 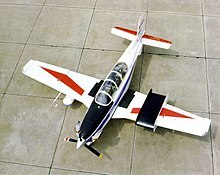 The T-34A Mentor remained the standard USAF primary trainer until the introduction of the Cessna T-37 Tweet jet trainer in the late 1950s, replacing both the T-34A and T-28A. This also coincided with ATC's implementation of the Undergraduate Pilot Training (UPT) syllabus at various air force bases in the United States under ATC claimancy and phaseout and closure of the contract pilot training air bases. As they were replaced by T-37s, many T-34As were turned over to USAF aero clubs at air force bases in the United States and USAF air bases overseas. In all, the USAF acquired 450 T-34As. As the U.S. Air Force replaced the last of their T-34As at the beginning of the 1960s, their role taken over by the propeller-driven T-41 Mescalero and the T-37 Tweet primary jet trainer in UPT, those T-34As not allocated to USAF aero clubs or marked for foreign military sales or transfers were turned over to the USAF Auxiliary, the Civil Air Patrol, for use as search aircraft. 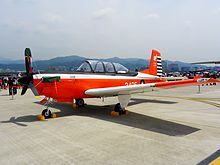 However, the T-34A's low wing limited its utility in an aerial search and rescue role, and maintenance issues, particularly expensive wing spar repairs that became apparent in the late 1990s, resulted in the last of the former USAF T-34As being withdrawn from CAP service by 2003. The U.S. Navy kept the T-34B operational as a Naval Air Training Command initial primary trainer at the former Naval Air Station Saufley Field, Florida until the mid-1970s and as a Navy Recruiting Command aircraft until the early 1990s when the last examples were retired as an economy move. Others continue to remain under U.S. Navy control as part of flying clubs at naval air stations and marine corps air stations. The T-34C is no longer used as a primary training aircraft for U.S. Navy, U.S. Marine Corps and U.S. Coast Guard Student Naval Aviators and various NATO/Allied/Coalition student pilots training under U.S. Navy auspices. It has been replaced by the T-6 Texan II. Training Squadron TWENTY-EIGHT at NAS Corpus Christi's Training Air Wing FOUR recently retired the T-34C as a Naval Primary Training Aircraft according to Chief of Naval Aviation Training (CNATRA) PAO, joining Training Air Wing SIX at NAS Pensacola, Training Air Wing FIVE at NAS Whiting Field and Training Air Wing FOUR's Training Squadron TWENTY-SEVEN at NAS Corpus Christi had already transitioned to the T-6A and T-6B models. Several other T-34Cs also remain in service with the Naval Air Test Center at NAS Patuxent River, Maryland and as aerial spotter aircraft with F/A-18 Fleet Replacement Squadrons (FRS) and Strike Fighter Weapons and Tactics Schools at NAS Oceana, Virginia; NAS Lemoore, California; and MCAS Miramar, California; and the Naval Strike and Air Warfare Center (NSAWC) at NAS Fallon, Nevada. The United States Army received six ex-U.S. Navy T-34C, used as test platforms and chase planes at Edwards Air Force Base, California and Fort Bragg, North Carolina. NASA Armstrong Flight Research Center (formerly the Dryden Flight Research Center) at Edwards, California has operated two T-34C aircraft. The first aircraft was previously flown at the Glenn Research Center in Cleveland, Ohio, where it was used for propulsion experiments involving turboprop engines. In 1996 this aircraft was moved Dryden as a chase aircraft. That aircraft was returned to the U.S. Navy in 2002. The second T-34C was obtained in early 2005 from the Naval Air Warfare Center Aircraft Division (NAWCAD) at NAS Patuxent River, where it was due to be retired. At Armstrong, the T-34C is primarily used for chasing remotely piloted unmanned air vehicles which fly slower than NASA's F/A-18 mission support aircraft can fly. As a NASA mission support chase plane, the back seat would be occupied by a photographer or flight test engineer during research missions. It is also used for required pilot proficiency flying. As of 2007, Mentors are still used by several air forces and navies. From 1978, the T-34C Turbo-Mentor was the Argentine Naval Aviation basic trainer used by the 1st Naval Aviation Force (Training), alongside 15 T-34C-1 light attack aircraft forming the Fourth Naval Air Attack Squadron. During the 1982 Falklands War, four T-34C-1s were deployed to Port Stanley on 25 April 1982, primarily to be employed in a reconnaissance role. The main encounter with British forces occurred on 1 May 1982 when three Turbo-Mentors attacked a Royal Navy Westland Sea King helicopter in the area of Berkeley Sound but were intercepted by Royal Navy Sea Harriers flown by Lt 'Soapy' Watson and Lt Cdr 'Sharky' Ward of 801 Naval Air Squadron flying from HMS Invincible, with one of the T-34Cs being damaged by cannon fire from Ward's aircraft. The four T-34C-1 Turbo-Mentors continued to operate, flying a few reconnaissance missions, but were redeployed to Borbon Station where they were ultimately destroyed by the SAS Raid on Pebble Island on 15 May 1982. Although all four hulks remained on the island for a considerable length of time, eventually, 0729/(1-A)411 was recovered on 10 June 1983 and stored for future display at the Fleet Air Arm Museum. In 2004, due to a series of crashes involving in-flight structural failure during simulated combat flights, the entire US civilian fleet of T-34A/Bs was grounded by the Federal Aviation Administration. The grounding has since been eased to a slate of restrictions on the permitted flight envelope. Via a series of Airworthiness Directives (ADs) established by or Alternate Methods of Compliance (AMOCs) negotiated with the FAA, including installation of certain, approved structural modifications to the wing spar and other repairs, the T-34A and T-34B fleet in 2011 has been restored to full flight status by FAA at the Mentor's originally designed limitations, provided each individual example is compliant with those ADs and AMOCs. The Mentor is the aircraft used by the Lima Lima Flight Team and Dragon Flight, both civilian demonstration teams. 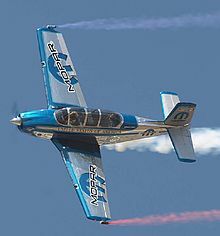 It is also used by aerobatic pilot Julie Clark, who flies her T-34 "Free Spirit" (registration N134JC) at air shows. A U.S. Navy T-34B assigned to NAS Saufley Field in the 1950s. US Air Force trainer. Replaced by the Cessna T-37 around 1960 (450 built). US Navy trainer. Used as a trainer until 1976, when VT-1 and VT-5 were decommissioned. It was replaced by the T-34C (423 built by Beechcraft). T-34Bs were flown by pilots assigned to the Navy Recruiting Command until the mid-1990s. Two T-34Bs were fitted with turboprop engines, and were used as T-34C prototypes. Two-seat primary trainer, fitted with a turboprop engine. Equipped with hardpoints for training or light attack, able to carry 1,200 lb (540 kg) of weapons on four underwing pylons. The armament could include flares, incendiary bombs, rocket or gun pods and antitank missiles. Widely exported. Conversion of surplus T-34 Mentors to be powered by Allison Model 250 turboprop engines. Royal Canadian Air Force - 25 T-34A built in Canada by Canadian Car and Foundry evaluated from 1954 to 1956 with RCAF Courses 5409 and 5411, RCAF Station Penhold, Alberta, until donated to other air forces. Colombian Air Force – Purchased 50 T-34s in 1954, with six more acquired in 1970 and 10 in 1977. The final T-34 was retired in December 2013. ^ a b c d e Morris, Frank. "A Short History of the Beechcraft Mentor." philfarq.com. Retrieved: 13 November 2007. ^ a b c d e f g h i j k l m n Phillips, Edward H. Beechcraft – Pursuit of Perfection, A History of Beechcraft Airplanes. Eagan, Minnesota: Flying Books, 1992. ISBN 0-911139-11-7. ^ "T-6 specifications." militaryfactory.com. Retrieved: 13 November 2007. ^ Bridgman 1956, pp. 230–231. ^ "Beech Jet Mentor". Kansas Aviation Museum. Retrieved 15 October 2016. ^ a b c Taylor, M. J. H., ed. Jane's American Fighting Aircraft of the 20th Century. Lombard, IL: Mallard Press, 1991. ISBN 0-7924-5627-0. ^ "Factsheets: Beech T-34A Mentor. "National Museum of the US Air Force. Retrieved: 22 February 2015. ^ a b Harding 1990, pp. 27–28. ^ "T-34C Mission Support Aircraft" NASA. Retrieved: 29 April 2015. ^ Villarino, Horacio. Exocet (in Spanish). Buenos Aires: Siete Dias, First edition 1983. ISBN 950-10-0116-4. ^ "Beechcraft T-34A & C Mentor." Archived 15 May 2008 at the Wayback Machine britains-smallwars.com. Retrieved: 30 August 2010. ^ Morgan 2006, p. 78. Quote: "This changed around midday when Lieutenant Soapy Watson and Lieutenant Commander Sharkey Ward were vectored onto three Mentor light attack aircraft about to attack a Sea King in the area of Berkeley Sound." ^ Freedman, Sir Lawrence. The Official History of the Falklands Campaign. Abingdon, UK: Routledge, 2005. ISBN 0-7146-5207-5. ^ "Beech T-34C." aviation museum.eu. Retrieved: 30 August 2010. ^ Taylor 1988, p. 325. ^ a b c d e f g h i Taylor 1988, p. 329. ^ International Air Power Review Summer 2001, p. 31. ^ Wheeler Flight International 4 October 1980, p. 1329. ^ Wheeler Flight International 4 October 1980, p. 1330. ^ Rivas, Salvador. "Columbia Retires the Mentor". Air International, Vol. 86, No. 2. February 2014. p. 9. ^ Wheeler Flight International 4 October 1980, pp. 1331–1332. ^ Air International June 1972, p. 302. ^ Taylor 1988, pp. 329–330. "Arabian Fledgling...the Royal Saudi Air Force". Air Enthusiast, June 1972, Vol. 2, No. 6. pp. 300–308. Drendel Lou. T-34 Mentor in Action. Carrollton, Texas: Squadron/Signal Publications, 1990. ISBN 0-89747-249-7. "Fuerza Aérea Boliviana". International Air Power Review. Volume 1, Summer 2001. pp. 28–31. ISSN 1473-9917. Morgan, David. Hostile Skies: My Falklands Air War. London: Phoenix Publishing, 2006. ISBN 978-0-7538-2199-2. Wheeler, Barry C. "World's Air Forces 1980". Flight International, Vol. 118, No. 3726. 4 October 1980. pp. 1323–1378. ISSN 0015-3710. Wikimedia Commons has media related to Beechcraft T-34 Mentor.